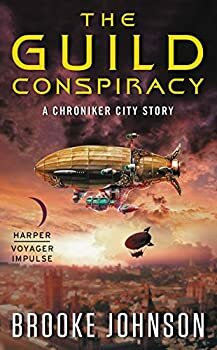 Published in 2016, The Guild Conspiracy, by Brooke Johnson, is the second book in the CHRONIKER CITY STORIES series. It begins about six months after the events of Book One, The Brass Giant. Petra Wade, a young woman fighting to be accepted as an equal in the Engineers Guild, continues her struggle while also waging an asymmetrical battle against Julian Goss, an engineer who has a terrifying view of a mechanistic future world and is willing to orchestrate a war to get it. I liked The Guild Conspiracy much better than I liked The Brass Giant, mainly because any romance is in the background, and most of the story is focused on Julian’s horrifying scheme and Petra’s attempts to thwart him. Without the distractions of first love, Petra behaves more intelligently for the most part in this book. She remains in a position of little or no power throughout: she is a student at the Chroniker City University only on the sufferance of Goss; she is a woman and very few women have been admitted as engineers; she is seen to be of a lower class than most around her. Nearly everyone wants to exploit her engineering brilliance while dismissing her. Johnson opens the book with a dedication: “To all the girls who were told they couldn’t. To the girls who tried and failed. To the girls who keep fighting anyway,” and I think those girls, reading this book, will be engrossed in the story and proud of Petra. At the end of The Brass Giant, Goss had extorted Petra into building a battle-mech for him. Emmerich Goss, Julian’s son and Petra’s lover, had gone off to France. One way Julian exerts pressure on Petra is by keeping her and Emmerich apart. Petra has stalled the project as long as she can. When Julian threatens her, she realizes she must build a prototype mechanical giant. Petra has a scheme that she thinks will keep the metal giant from going into mass production, but she has not fully understood Julian’s ruthlessness. To make matters worse, Julian has assigned a Royal Forces soldier named Braith Cartwright to watch Petra and make sure she doesn’t try to run away or sabotage the mech, and Petra must either evade Braith in some way or win him over to her point of view. Braith is a terrible soldier, but he’s a good character. In spite of the annoying trait of falling instantly in love with Petra for no apparent reason, he is smart, brave and, at least with Petra, honest. The relationship between Petra and Braith is not “insta-love,” because she is still pining for Emmerich, but more of the growing loyalty and trust of comrades in arms. It’s done well. Braith is a terrible soldier because he does not follow orders and he comes around to Petra’s side with very little struggle. I still liked him. The secondary storyline in which Petra tries to prove herself to the male students of the University by entering a secret “Battle-bots” contest is fun. It’s interesting to watch Petra have to use a different strategy in each match. As with the first book, The Guild Conspiracy is actually at its best when we see Petra thinking, designing and working on her creations. In this book we get a bit more world-building (for example, it’s confirmed that there is a Queen, that this is some version of the British Empire, and there is a London as well as a country called France). There is still plenty I don’t understand, like whether there is a Navy as well as an Army, or is it all just one big Royal Forces, and why the Engineers Guild seems to play such a critical role in investigations of treason (rather than some government arm) but this book pulls the camera back a bit and lets us see little more, and that’s good. The second half of the book becomes tense as we realize how high the stakes are if Julian isn’t stopped. Of course Petra fails repeatedly, and with each failure the stakes are higher and the consequences more frightening, which steadily increases the tension. At the end of the book, Petra, at least, is in a more secure position than she was at the beginning, but the struggle is not over, and now Emmerich is back in Britain. Petra has many choices to make. Young women fantasy readers who enjoy steampunk and/or like building robots (there’s overlap in those groups) will probably enjoy both books. For that matter, I think young male robot-building readers would enjoy this one because there’s more tension and more robots. The Guild Conspiracy is a good YA adventure. Published August 9, 2016. In the face of impossible odds, can one girl stem the tides of war? It has been six months since clockwork engineer Petra Wade destroyed an automaton designed for battle, narrowly escaping with her life. But her troubles are far from over. Her partner on the project, Emmerich Goss, has been sent away to France, and his father, Julian, is still determined that a war machine will be built. Forced to create a new device, Petra subtly sabotages the design in the hopes of delaying the war, but sabotage like this isn’t just risky: it’s treason. And with a soldier, Braith, assigned to watch her every move, it may not be long before Julian finds out what she’s done. Now she just has to survive long enough to find another way to stop the war before her sabotage is discovered and she’s sentenced to hang for crimes against the empire. But Julian’s plans go far deeper than she ever realized . . . war is on the horizon, and it will take everything Petra has to stop it in this fast-paced, thrilling sequel to The Brass Giant. Hrm, I do like robots… Glad to see you liked this one better than the first book, and hopefully that means good things for the book(s)-to-come!